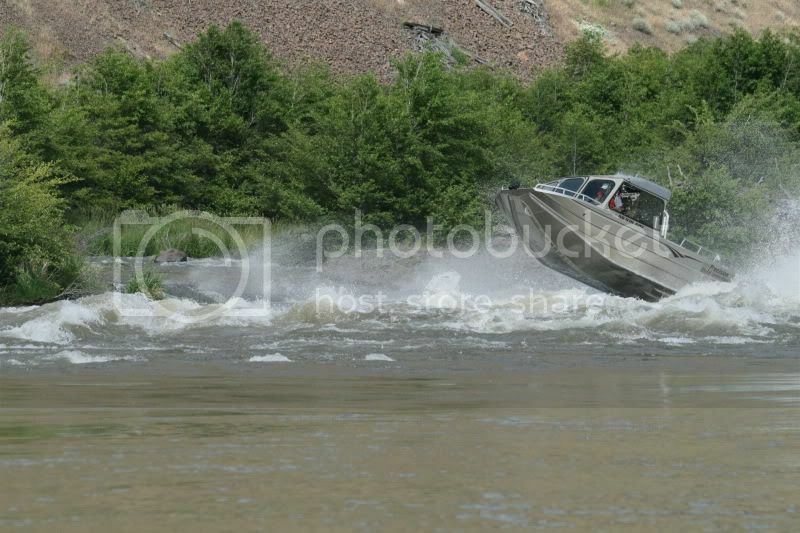 River Jet Boating Forum • View topic - 03 Northwest Jet re’built not bought. 03 Northwest Jet re’built not bought. So I was jet boat shopping and when your buddies say you could get more boat for your buck if it needed some work it really broadens your boat shopping parameters. I wanted a V8 19’ ish and within my budget. We were passing for sale ads back and forth for months figuring I have all winter to come up with something and we came across a 03 NWJ 6.0 212 that had been a “little bit sunk” on the Palouse river. Kicked it around lots of emails back and forth next thing you know we’re Tri City bound to just look at it. It’s a long drive from Junction City so we hope it is what we’ve been told. After my buddies talk me into it (they were to good of salesman we almost got in a bidding war). Pay the fella hook up to a boat with two big holes in the bottom, probably a froze up motor and still full of river silt..what could go wrong. The drive home was full of laughs planning and all the future sweet jet boating we were going to do, we didn’t even let a blown tire at 75mph on I 84 phase us we knew this was going to be awesome...looking back we should of seen that as a sighn. This is NWJ is a bit of a fighter. The work was about to begin, straight into Burksfab (Will) shop so him and Apfeiffer82 (Andy) and I could get started. Engine and pump come out nice and easy, next thing you know Andy looks at me and says are you ready with a skill saw in his and and cuts a 36” x 12’ section of the floor out. There may of been more planning then that but man that’s what it felt like. Out with the old....now what. Last edited by Delbert on Fri Sep 07, 2018 2:54 pm, edited 1 time in total. Re: 03 Northwest Jet re’built not bought. It’s up and running rivers now, I’m just slow on build pics. Spent my nights working on the boat, we started this project back in October. I have some flange straightening pics coming soon. After hours of dead blowing dents out with random backers and what ever we could get in place smack it with the floor and sides was lookIng fairly straight. Time for the new 1/4” bottom, Andy got off work early and had the whole bottom tacked in place before I could even see the magic happen. It turned out very nice and a perfect fit. Will holding the big hammer backer. Andy matching the old to the new. Shop buddy telling me it’s time to go home for the night. Good story - enjoy the water!! Time for engine work, the engine was froze up but I didn’t know how bad it was. When the boat hit the rock it put a hole in the oil pan that’s what shut the boat down. It really wasn’t that bad when I got it opened up. I think the hole in the oil pan let the water out of the engine when it was recovered. A couple of the cylinders had taken on some water and there was rust on the cylinder walls. I honed the worst one and It came out decent. Took it to my machinist buddy and he said it was runnable. I pondered and kicked it around and decided the build had been going so well I would buck up and punch it .30 with some new forged pistons. If it wasn’t a boat that was going to live in the river I would of probably ran it with a hone job and fresh rings. Since I was waiting on engine parts and the machine shop it was time to install the pump and new intake. Checked the pump for flatness, it had a slight warble to it so we clamped it down whacked it a couple times and it seemed to come back into place at least enough that bolts and sealer will make it up...or so we thought. That’s installed bolts tight and you can see it hasn’t even started to squeeze out the sealer and I wasn’t shy on the application. Is what we found (like Eagle 1 stated earlier) the pump was flat edge to edge but the inner sealing surface was humped up almost a 1/4” and it wouldn’t budge. After asking for some help on here River John chimed in and talked me through straightening it. Built a jig out of 2x3 1/4 wall tube and started heating and tightening. It took a couple nights of trying this and trying that’s, getting a little bolder with the heat until we finally got it dialed. River John said he hadn’t broke a housing yet so we kept cranking on it. That housing will take a incrediable amount of heat before giving up shape, whatever alloy combo they use on those housings I’m impressed. Some good sealer and lots of it, she’s water tight now. It bolted down nice and smooth had a good bead of sealer pushed all the way around. Had lots of helpers during this part, everybody likes making it look pretty. All primed up and heading for the booth. After lots of playing with graphics and google not knowing what to do we went with some simple stripes to break up the green. Nice part about going with vinyl is it’s not permanent, way less pressure then laying down paint. Sweet Job. Did you get a ok price on dead boat ? It’s fun to see how proud the kids are knowing how hard we worked on it to make it nice again, lessons kids don’t get very often these days plus it’s cool to hear them tell people what there dad and his friends rebuilt. Got the engine back and a big box of parts from summit. The weather was starting to change and the NWJ had already missed a couple runs so my motivation level was high. Went full ARP studs and bolts for the mains, rods and heads. Was very impressed with quality, these are heavy and torque down nice get a very clean torque click. I didn’t know much about the internals of the LS until this build but they are built pretty stout, the bottom end is damn near bullet proof with the full width tight to block 6 bolt main caps. Got a factory pressure high volume ported and polished oil pump from Tick performance those guys were great to deal with it. .30 over forged DSX pistons, one of the rods was out of specs and there a cracked design so they can’t be machined so we had to order a new one. It’s a pretty cool and strong design the way they are cracked and split. Had all the parts balanced and also had the rods machined to go with a full floating design instead of a pressed fit piston. This was DSX racing’s idea and best fit for there pistons. They talked to the machinist and gave him the specs, it turned out really nice and this design is happier living at a higher rpm. First of many fuel stops with this boat, I was on my way to Wills shop for engine install and fire it off the hose. Well it didn’t go according to plan. We got the fuel system primed and it would give a little flutter then crank flutter then crank. Pulled first plug and it had spark and had been firing pulled second plug it was wet with fuel and had never had spark to it. Pulled the rest of the plugs and all but number one had never been fired. We went through all the wiring checking and double checking new crank and cam sensor and couldn’t get anything more then the flutter. We decided to regroup and with heads hung I towed the boat home with it not running. Spent the next couple nights tracing and pin out testing the ecm, coils and everything else that had something do with spark. Everything has checked out and multiple calls to marine power we decide it was a faulty ecm. Ordered a new ecm and with fingers crossed I plugged it in and hit the key. Sweet job, good feeling when the motor runs like a top!! Looks like you're coming out ahead! Nice job congrats!! Even though the fab work took place in my shop I still enjoy reading this. It was a fun winter project and turned out really nice. I would definitely talk him into doing it again. Just a heads up. Don't run that Hamilton rear water cutless bearing without water. It will die. Great job on boat. Eagle1 wrote: Just a heads up. Don't run that Hamilton rear water cutless bearing without water. It will die. Great job on boat. I did the break in with no driveline in it, I put it through a dozen or so heat cycles. Ran it until I had good confidence in it changed the oil pulled the motor to throw the driveline in it and was headed to the local lake for a couple test runs. We headed out to Fern Ridge, Andy took his Koffler for the just in case factor. We cruised around getting some time with a load on it before we really got into it, towards the end of the day it was time to see what it would do. Thing sounded so good all exhasut and injectors firing was very happy with how it came out. Had a few water leaks around the pump reverse brake on the linkage wasn’t working and the steering was very stiff under load. Little punch list to knock out we were headed to the river. Cool thread and great job. Whats the story on how they sunk it?